i first had panzanella when my cousin made it for a family party, and now this may be my favorite salad ever. aside from caesar salad when you use these croutons. it’s so easy and very customizable- you can add bell peppers, avo, carrots, onion, artichokes, olives. this is one of the very few things i’m a purist about, and i only like cucumbers and tomatoes as my produce in here. i don’t really use a recipe. it might have an unusual name (usually when i mention panzanella, i get an “umm what” kind of reaction), but it’s a salad, people (though yes i understand the urge to follow a recipe and try to stave off disaster. i promise this will be amazing no matter what!! unless you burn the bread; at which point, shave off the burnt bits and use the rest and it will still be delicious). this time i cubed 3 cucumbers, 2 tomatoes and 1/3 loaf sourdough bread. the cucumbers and tomatoes got tossed with half of a long log of fresh mozz (which also got cubed). one clove minced garlic went in, along with extra virgin olive oil and balsamic vinegar to moisten. it might be more dressing than you’re used to, but the bread needs a lot of moisture to help it soften up. said bread can be cubed by knife or torn by hand. the latter works really well when the bread is too stale to cut through without sweating mildly (or heavily, if you’re out of shape and/or you don’t have julie bowen arms). it got toasted in a skillet with some oil and 2 garlic cloves, though baking also works. you can toss it occasionally, or you can flip each cube painstakingly. your choice. people procrastinate in all sorts of ways. the real star of panzanella is the bread, though everything else is super tasty as well. i like it when the bread is a little crunchy, but also soft. almost as if it is back to its original texture, but with so much more flavor. the tomatoes and basil and cuc are fresh, while the mozz mellows things out and is a little creamy. 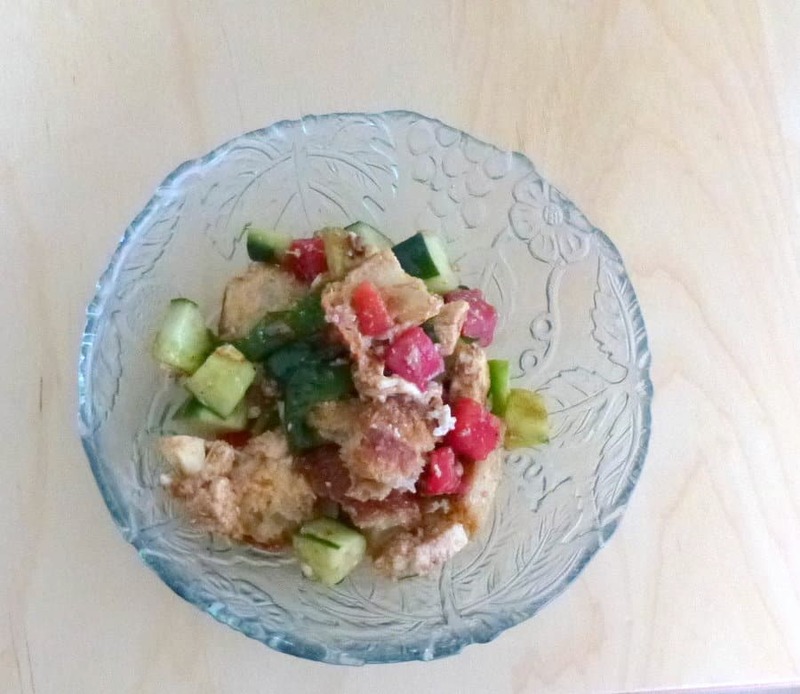 my panzanella tends to be really garlicky, so i’d suggest scaling back the garlic or cooking it more if you care what your breath smells like (i don’t, really). very rough recipe that’s more guidelines than true recipe that you need to follow. feel free to add more veggies, or meat, or other herbs. Heat some canola oil in a large skillet. Add the bread and garlic. Toast until the bread is golden and crisp. You can also do this in the oven; bake the bread in a single layer on a baking sheet at 375F for 10-15 minutes, or until the bread is golden and crisp. Toss everything with extra virgin olive oil and balsamic vinegar to taste. Season with salt and pepper. Let marinate until the bread has softened. If it appears that the bread is still too dry, add more extra virgin olive oil.